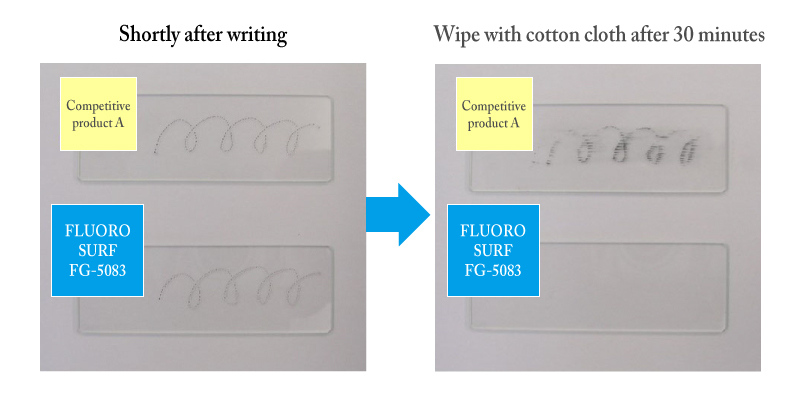 Coating of FLUOROSURF decreases attachment of fingerprint or other various stains and allows attached stains to be easily wiped away. ■By coating surfaces with this agent, fingerprint and other stains attaching to those surfaces decrease and attached stains can be easily wiped away. The high adhesion of the film keeps functions after the stains are wiped away with tissue paper or the like. ■Coefficient of dynamic friction of the surface is low (μ = 0.09 or less) and provides dry lubricating surface. For simplicity’s sake, oil-based ink is used for this test. Fingerprint attaching decreases by coating as in the case of this ink and attached fingerprint can be easily removed. Essential performance of antifouling coating is to prevent stains from attaching and abrasion resistance. FLUOROSURF FG-5000 series has cleared abrasion tests of more than 10000 times. When a FLUOROSURF is applied, the sticking force of stain is reduced and it is difficult for the stain component to stick and easy to remove it. Fingerprints consist of oil composition and the water contact angle cannot be used to express the performance of anti fingerprint! The slip drop angle of oil in effect indicates the performance of anti fingerprint . 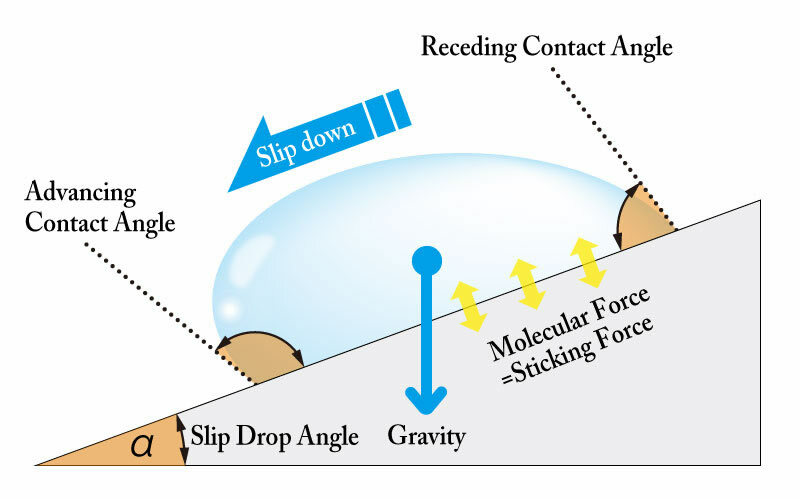 The slip drop angle refers to the angle at which a liquid droplet placed on a surface starts to slide when the surface is tilted. 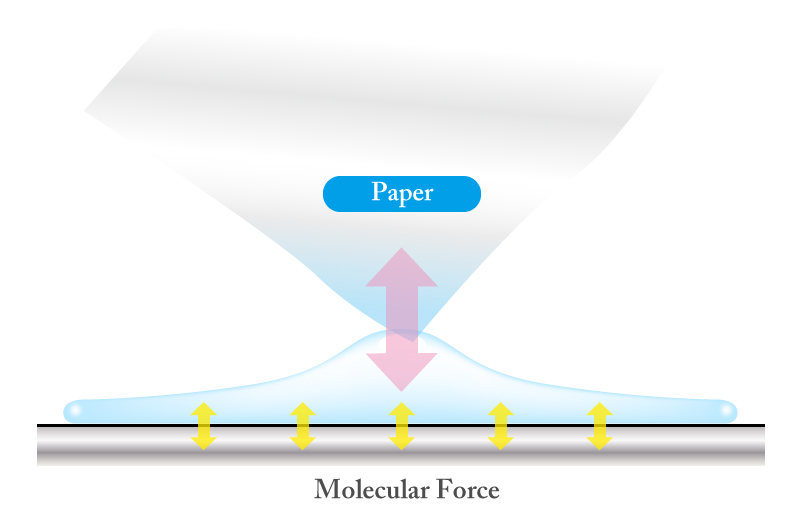 The slip drop angle is determined by the sticking force of the stain and the gravitational force on the oil droplet, and the droplet begins to slide when the adhesive force < gravitational force. The weaker the sticking force of a fingerprint, the smaller is the slip drop angle. ➡ The water contact angle is high, but the ink cannot be wiped off. ➡ Slip drop angle is high in both of water and oil . This means finger print stick strong. ➡ The water contact angle is not so high . ➡ But the slip drop angles of oil and water are both small . It is easy to wipe off oily ink. 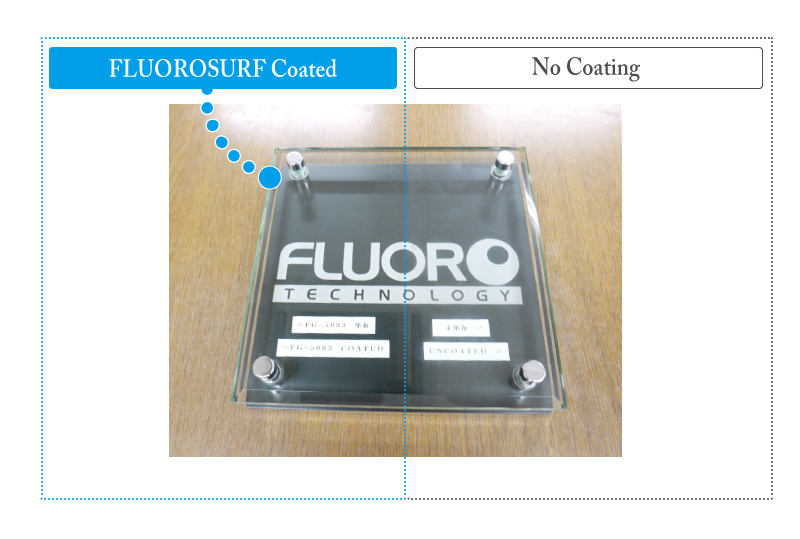 FLUOROSURF is designed to have small slip drop angle of oil . And it is excel in substantial fingerprint prevention performance. ■The agent is chemically combined with glass, metal and various other materials at ambient temperature and forms clear antifouling film of high adhesion and hardness (pencil hardness of 6to 9H). ■When coating plastic or materials other than glass and metal, pretreatment of coating the attached special-purpose primer coat helps formation of similar high adhesion and hardness antifouling film. Essential key point to produce the abrasion resistance of FLUOROSURF is the structure of the coating film. 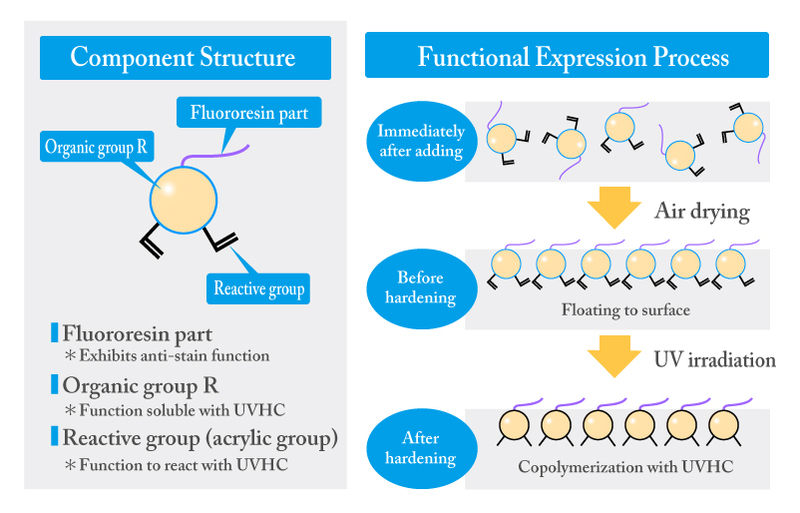 As shown in the above diagram, the coating compositions are combined with the material by tight binding reaction and the fluorine film is integrated with the material. 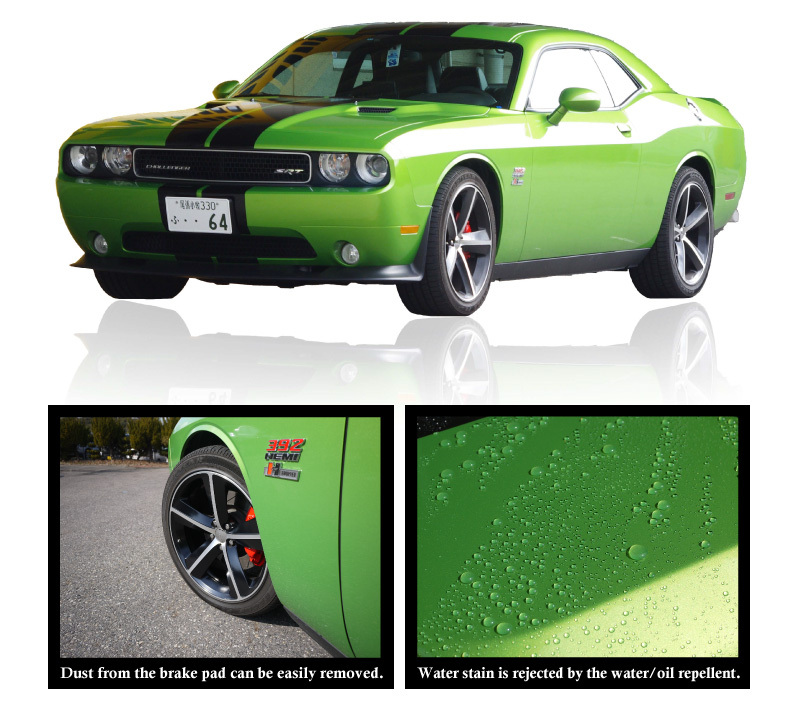 Adds anti-stain, low friction and low refractivity properties when used as an additive to UV hard coat agent. The oil slip drop angle is low and the product excels in substantial fingerprint adhesion prevention performance. When included as an additive, the fluoride component moves to the surface and exhibits its properties. Compared to other competitive products, a smaller amount of additive displays its effect and provides superior cost performance. ＊ Drying : Room temperature 1-2 minutes. ＊ Selectable film thickness 0.1-10 micron meter. Various specifications of each series are available to answer any requirements of customers. Please inquire of our customer service section about details of each product.